Heredis 2019 is the ideal solution to design your family tree on your PC. Rich in features, it provides you with four angles of view to visualize your family, allows you to customize your family tree by adding the photo of each member of your family, but also to consult missing elements such as the date of birth of a relative, or his place of life. The "Extended Family" tool presents the composition of your family as a whole: from brothers-in-law to little cousins, including the children of stepfamily spouses. Heredis 2019 for PC also includes the innovative "Migrations" feature, which allows you to trace the lives of your ancestors and their geographical paths using interactive maps. A good way to get to know your family better and to put words to your origins. The "Biography" module offers you a literary portrait of the central character. The latter uses the elements entered about him when creating his personal file. Easy to use, Heredis 2019 has an intuitive interface that makes it easy to search and publish your data. To keep an eye on the evolution of your family, there is nothing more practical than having an up-to-date family tree. 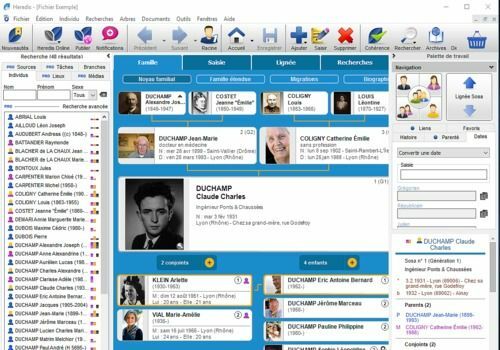 Since design is important and complex, the use of software such as Généatique can be useful. The Route Map of France 1783 shows in detail the road network as it existed in the 17th and 18th centuries.